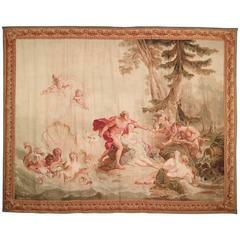 Add a handcrafted touch of artisanship to any room with this range wall tapestry. Sized as a king headboard in neutral shades of grey, black and cream, this flexible work of art can be used to adorn any wall or customized as a room divider. Handcrafted with black, cream and grey felt panels with functional black leather top links designed to be placed on wall brackets or pegs. Made in Brooklyn, NYC. Custom options include tapestry size, colors and materials. Available for an additional fee are two mounting options; a wooden peg rail similar to what is featured or flush mount individual threaded brass wall pegs. Dimensions (approx): 4' H x 7' L. Style No. ITP1706-KSHA. Production Time 3-4 weeks. Rush fee is 25% of list price. Der Artikel kann innerhalb von 0 Tagen ab Lieferung zurückgeschickt werden. "Bright Twig" oder "Ljus kvist" ist ein Märta Måås Fjetterström Wandteppich aus Skandinavischer Moderne von Barbro Nilsson. Entworfen in der Mitte des 20. Jahrhunderts.